Denise Chase is a 1994 graduate of The Ohio State University College of Veterinary Medicine. She opened Pleasant Ridge Pet Hospital in August of 2000 and has been happily practicing here ever since. She lives in Mt. Washington with her husband, 2 children, 2 Dobermans, one cat, a chinchilla, and four chickens. She has a special interest in exotic and pocket pets. Jordan Albrecht, also a graduate of The Ohio State University College of Veterinary Medicine, joined us full-time in 2012 and has quickly become an important part of our team. We are sure you will appreciate her thorough, caring approach and skill in caring for her patients. She enjoys medicine and surgery. Dr. Albrecht lives in Milford with her husband and their 2 dogs and 2 cats. Laura Vonderhaar is a Cincinnati native (big fan of Goetta and Skyline!!) and a 2013 graduate of The Ohio State University College of Veterinary Medicine. She pursued veterinary medicine as a second career after having been an accountant for many years. Her interests include preventative medicine, client education, and surgery. 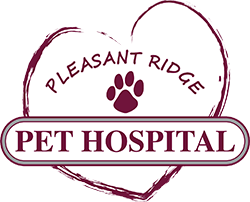 Jacob Wasserman is excited to be joining the team at Pleasant Ridge Pet Hospital! Jacob and his wife are Xavier graduates and love living in the Cincinnati area with their son (and many pets). Jacob is a 2013 graduate of The Ohio State University College of Veterinary Medicine and has spent the last few years at a small animal practice in Mason, OH. He has a strong interest in surgery, specifically orthopedics.